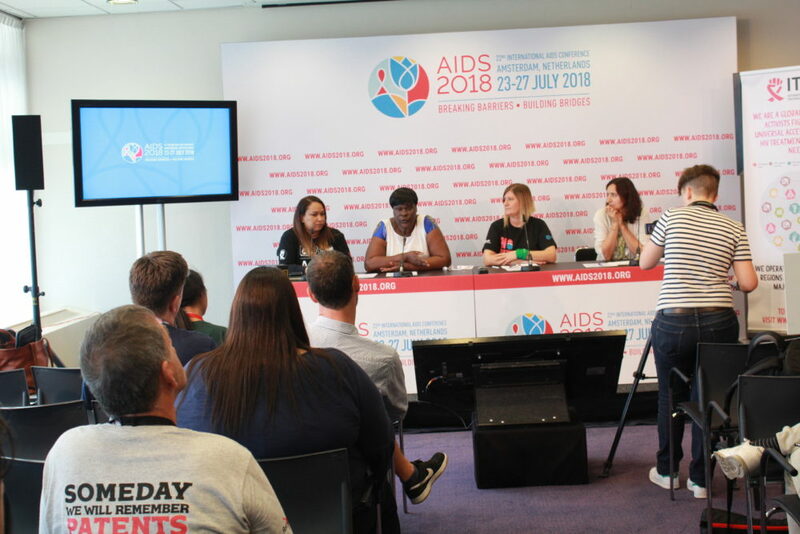 On Tuesday, 24 July 2018, ITPC hosted a press conference at AIDS 2018 to build on the momentum of the Community Activist Summit to cut through the noise and unpack the issues behind some of the most divisive questions today. Download Cutting Through the Noise of AIDS 2018 press release (PDF) here or read the entire text below. AMSTERDAM, The Netherlands – 24 July 2018 – Throughout the AIDS response, conferences have been notoriously plagued with rhetoric too far removed from the lived realities of people living with HIV. This year, however, in the midst of one of the world’s biggest gatherings on HIV and AIDS, hundreds of activists gathered to expose harsh truths, and debate the steps forward toward systematic change. On Sunday, 22 July 2018, ahead of the 22nd International AIDS Conference (AIDS 2018), over 250 activists from around the world gathered in Amsterdam for the Community Activist Summit. “The world has changed, and so activism has had to change. Today, we have an opportunity to share stories of our journey and challenge ourselves to create a vision that isn’t influenced or dominated by the donors and geopolitical forces that continue to imposes their agenda on the communities they claim to serve,” explains Solange Baptiste, Executive Director of the International Treatment Preparedness Coalition (ITPC), the global HIV treatment organization that hosted the Summit. The Summit brought together people living with HIV and key population activists, civil society and community advocates, program implementers, government officials, and all stakeholders interested in and seeking to influence a global, community-led HIV advocacy agenda. Over the course of the one-day event, activists and allies reflected on how far the HIV movement has come, the state of activism today, and how to address our most critical problems in innovative ways. Leaders reflected that despite all the progress made over the last fifteen years, communities are still dealing with the same issues that stop people from accessing the medicines they need to live. “It has been 30 years since I was diagnosed. And now my fellows in Venezuela are facing the same fears I faced back then. Eighty thousand people are without treatment. There’s no CD4 [testing]. No viral load [test]. There’s NO FOOD! We are in the worst AIDS crisis of our time,” said Jesus Aguais, founder of Aid for AIDS. “I am coming from a country where we talk about an end to AIDS, but we have an estimated 600 new infections EVERY DAY,” said Anele Yawa, secretary-general of Treatment Access Campaign (TAC) in South Africa. Despite all these challenges, hope is not lost. The HIV movement continues to be fueled by the passion, drive, and lived realities of community activists who know that progress today requires perseverance, solidarity, and creativity. The critical need to transition from a financing model that allows donors – instead of communities – to drive the agenda of the HIV response. The movement must also be refueled by fresh faces and new alliances. Young activists continue to enter the space and embrace this growing mandate. “We need to mobilize communities and support them – no matter where they are, from Fiji to Venezuela, all people deserve the basic right to health. The fight must go on!” explained Baptiste. Building on the momentum of the Community Activist Summit, ITPC will grow it’s Activist Development Programme to do just that. Download Cutting Through the Noise of AIDS 2018 press release (PDF) here.